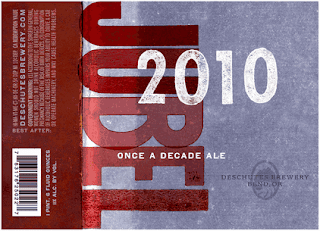 Deschutes Brewery from Bend, Oreg., promotes Deschutes Jubel 2010 as a "once a decade ale." Well, sort of. The beer can be found on draught at its pubs as Super Jubel around the holidays. This is, however, only the second time it has been bottled. The last time was back in 2000 to celebrate the new millennium. Deschutes Jubel 2010 is a rich mahogany color and pours with a thin head. There is a subtle malty nose in this 10 percent alcohol by volume brew. This beer is fairly easy drinking, but clearly shows a strong malt backbone in the flavor profile. Hops are present, but not the story with this beer.